This Kick Off! 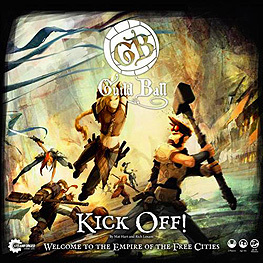 box set contains everything you need for two players to play a match of Guild Ball, a Bloody mob football game of high action and high stakes. In Kick Off, players take on the role of team coach for either the rowdy Brewers of the Tactical Masons. Momentum swings back and forth between the teams as you make frenzied drives towards the other team's goal or attempt to beat opposing players into the dirt. You can choose your own path to victory, be it scoring goals to secure the win or sending the other team's players back to the bench. Kick Off! 's diverse characters are full of personality that comes to life on the Pitch. The included tokens and health dials make each character's plays easy to track as you combine their unique strengths to secure victory over the opposition. The Brewer's Guild is known for its rough and tumble brawlers who love little more than a good scrap. Bold and aggressive, the Brewers charge across the Pitch to steamroll their opponents and occasionally give the ball a solid boot towards the goal. The Mason's Guild is known for its tactical prowess and peerless flexibility. Through their teamwork and careful planning, the Masons can take down a key opposing player or create an opening that allows them to score on the opposing goal.